A couple wades through floodwaters in Paducah, Ky., Tuesday, July 7, 2015. Heavy rain in part of western Kentucky has led to multiple water rescues. Kentucky’s changing climate will test the resilience of its flood walls, sewer systems, crops, ecosystems and the health of its residents, according to the Fourth National Climate Assessment. 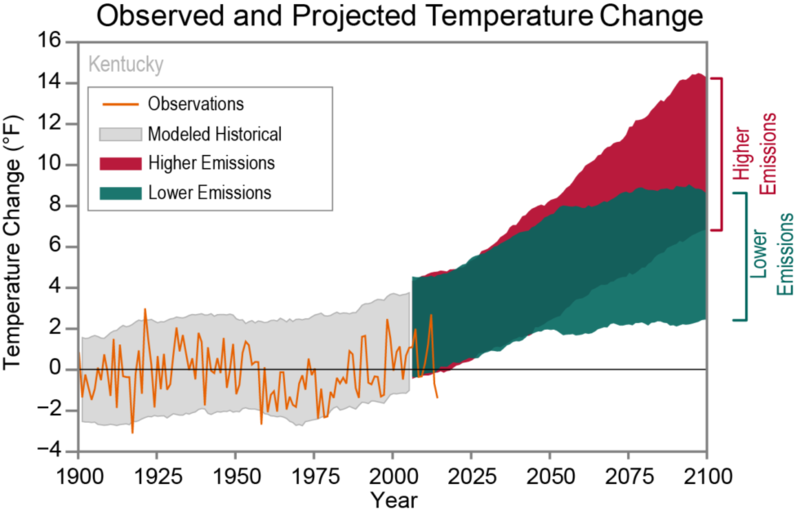 The report is notably blunt: The climate is changing faster than at any point in modern civilization and the responsibility rests squarely on the shoulders of mankind. The White House issued the report on Black Friday as much of the country recovered from Thanksgiving. The U.S. climate assessment comes little more than a month after a stark warning from the United Nations’ scientific panel on climate change that the world has just 12 years to reduce its reliance on fossil fuels to prevent the worst impacts of climate change. Friday's report directly contradicts the Trump administration's own policies, but confirms the country is already experiencing climate change and it will only get worse if we don’t reduce greenhouse gas emissions and prepare for the challenges ahead. Kentucky and the surrounding states will get warmer and the weather will become more unpredictable, bringing more frequent storms and droughts. 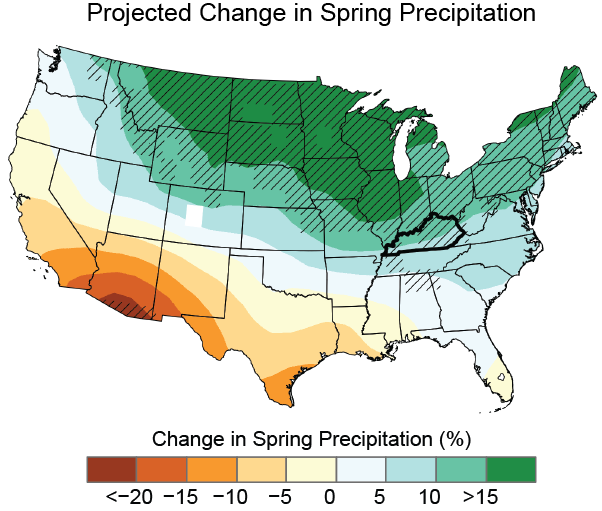 Much of the added rains will come in winter and spring, while changes to summer and fall precipitation are more uncertain, according to a National Oceanic and Atmospheric Administration report. Friday's report looks at the regional impacts of climate change. Kentucky is included as part of the Southeast Region, which spans the mangroves in Miami to the highest peaks of the Appalachian Mountains. While the local impacts vary state to state, the key takeaways remain the same. "For [the Southeast region], it gets warmer, it gets wetter and the seas rise," said Adam Terando, federal coordinating lead author for southeast chapter. "These things are getting worse, they are consistent with what we expect from climate change. They are affecting people today and they are likely to get much worse going into the future." Kentucky has already seen several extreme rainstorms this year, and that’s exactly the kind of weather that will become more common as climate change continues unabated. In Louisville, the storms further stress aging and overwhelmed sewer systems. It's forcing the Metropolitan Sewer District to dump vast amounts of sewage into rivers and streams. But it's also caused more than 38 million gallons of sewage and stormwater to spill into Louisville neighborhoods earlier this year. Severe storms across the region will also increase the chance a large flood will test the 29-mile flood protection system, much of which is aging and in need of repairs. Researchers estimate flooding will be even worse along smaller rivers and streams across the Ohio Valley, according to 2017 Ohio River Basin climate report by the U.S. Army Corps of Engineers. The warming weather will cause summers to last longer and increase the number of days above 95 degrees. That puts more people at risk of heat-related illnesses, and it also increases the amount of ozone that gets in the air. Already, Louisville isn't meeting EPA standards for ozone levels. High ozone can increase the odds of asthma attacks, respiratory infections and premature death. Children and people over the age of 65 and those with pre-existing conditions are the most at risk. "Climate change is affecting us now, it's not something that's in the future, it's something that’s going on right now," said Jeffrey Dukes, Purdue Climate Change Research Center director. Warming temperatures and changing rain patterns will help nature pick winners and losers, shifting the distribution and abundance of trees, plants and wildlife, Dukes said. Plants that do well in warmer climates, like the southern magnolia, will creep further north. At the same time, sugar maples and American beech trees will begin to disappear from Kentucky’s forests as they struggle to adapt to conditions brought about by warming temperatures. "You're basically scrambling up which species are best suited to which locations," Dukes said. "It's basically just giving a jolt to ecosystems, along with the many other impacts we are having to ecosystems." Longer summers will make for longer growing seasons, but the unpredictable weather won’t necessarily make it easier to farm. Also, higher minimum nighttime temperatures may cause plants like corn to become less productive, Dukes said. The longer summer could also increase the transmission of vector-borne diseases like ticks and mosquitoes. The climate assessment shows Louisville’s weather conditions are suitable for Aedes aegypti, a species that can spread dengue fever and the zika virus, though it’s not very common now. The assessment overview ends with a warning: climate-related risks will only get worse without action. The report notes that Americans are adapting to the changes, but not fast enough to avoid the worst impacts. "…neither global efforts to mitigate the causes of climate change nor regional efforts to adapt to the impacts currently approach the scales needed to avoid substantial damages to the U.S. economy, environment, and human health and well-being over the coming decades," according to the report. Right now, coal supplies 79 percent of Kentucky’s electricity and will continue to for at least the next three decades, according to 2016 projections from the Energy & Environment Cabinet. Minimizing those greenhouse gas emissions is one of the most important steps communities can take, said Terando, a lead author on the assessment. "Locally we need to be right now thinking about what are the risks, threats and vulnerabilities we have, whether they are structural or economic or ecological, how do we prepare for those so that we are minimizing our losses," Terando said.